Grenadain talismanic batsman, Emmanuel Stuart. 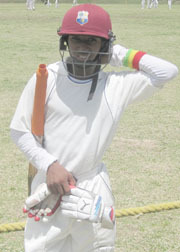 Grenada, powered by another brilliant unbeaten half century by talismanic batsman, Emmanuel Stuart, condemned St. Vincent and the Grenadines to a 7-wicket defeat — their sixth straight defeat — on the final day of play in the Windward Islands Under 15 Cricket championship at the main Arnos Vale Playing Field in St. Vincent on Wednesday. SCORES: SVG 115 in 46.2 overs, Grenada 116-2 in 24.5 overs. The dethroned champions looked a superior unit to their opponents in previous matches and re-enforced this with a compact bowling and fielding demonstration and later a dominant batting performance that that left little doubt as to the eventual result. After Stuart had called correctly and inserted the home team, his bowlers took control from very early in the proceedings and never let go. It was only through the major efforts of number seven Kerwin Williams, who made an unbeaten 26, that the host got past 100. Williams, who struck 3 fours, added 42 for the ninth wicket with Gregory Wyllie (8) to take the score over the 100 mark after they had slipped to 69 for 8. Captain Jeremy Layne contributed 18, and there were a whopping 47 extras, including 44 wides. 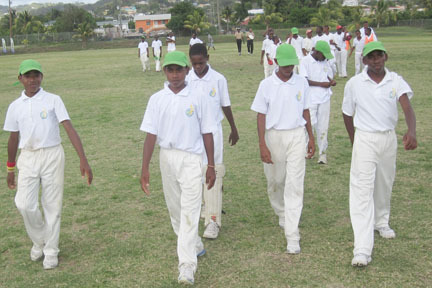 The bowling was led by Darron Nedd – 3 for 27, Narun Singh — 2-19 and Aviel Antoine — 2-36. The St. Vincent and the Grenadines team. 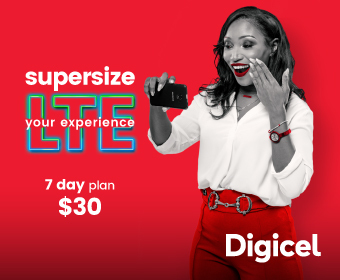 The Grenadians lost an early wicket in the chase but the advent of Stuart snuffed out any chance the Vincentians may have entertained of a fight back as he featured in two fine partnerships. First, he put on 54 for the second wicket, with Dejon Jeruakhan (22) then 43 with Donald McDonald (18) unbroken for third wicket. Stuart, who entered the final round as the lead batsman with 295 runs some distance ahead of the next best aggregate, stroked an unbeaten 54, decorated with 5 magnificent fours. The diminutive batsman, who lists Sachin Tendulkar, Shiv Chanderpaul and Marlon Samuels as his cricket heroes, imposed himself on the game from his entrée at the crease and it remained that way to the end. He ended the tournament with 349 runs at an average of 69.80 with 4 half centuries. Grenada finished second and SVG in the cellar position.